on Sunday, 13 August 2017. Dr. Patrick Kadama, Director of Health Policy at African Centre for Global Health and Social Transformation (ACHEST) made this remark on Monday 7th August 2017 while opening a four days training organized by ACHEST for the Civil Society Organization coalition on Reproductive Maternal Neonatal Child and Adolescent Health (RMNCAH) and ACHEST staff. The training that ran from 7th- 10th of August 2017 at Garuga Country Lake Resort in Entebbe hinged on one of the major Health Systems Advocacy Partnership project components of capacity building to strengthen civil society to engage effectively with governments, the private sector and other stakeholders accountable for health systems to deliver; equitable, accessible and high-quality SRHR and services. 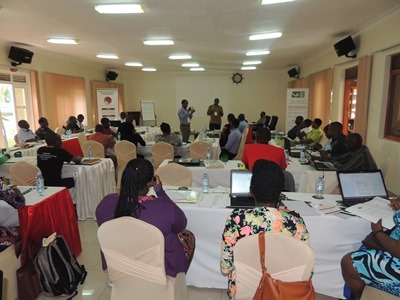 The training objectives were to: impart knowledge and skills base; and develop materials, tools and plans to drive advocacy agenda in Sexual Reproductive Health Rights specific to Human Resources for Health, Leadership and Governance. 35 members from 26 Civil Society Organizations working on Maternal health, Child health, Adolescents health, HIV/AIDs and Human Rights related issues were trained on: definitions of concepts used in advocacy and lobbying, advocacy and lobbying cycle, media advocacy, advocacy monitoring and evaluation, social accountability tools and advocacy monitoring and evaluation.